We've heard of beer goggles, but beer trousers? Meet "Bottle Rockets" by Bonobos, a new line of denim pants derived in part from reclaimed plastic beer bottles—the kind you get at concerts and sporting events. Available in natural canvas and indigo, the jeans get their color from the constituent materials, requiring no additional dyes. The bottles are collected, sorted, and cleaned by Earthspun, a textile company in North Carolina that shreds and melts them into liquid. After it’s extruded into long filaments, the material is blended with standard cotton fibers and spun into yarn. 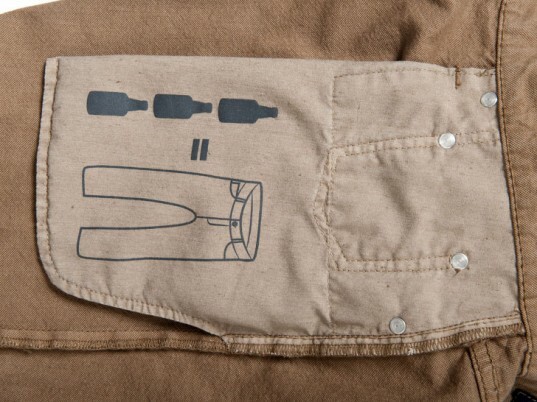 Each jean has a stamp that illustrates the number of beer bottles it diverted from a landfill. The yarn is then taken to the neighboring Cone Denim, one of the oldest textile mills in the world, where it’s woven into a tight, durable fabric. From North Carolina, the fabric heads to Los Angeles to be cut, sewn, and hand-finished into the final garments. Each jean receives a stamp on its pocket-liner to illustrate the number of beer bottles it diverted from a landfill: three for the natural canvas, five for the indigo. Turns out “last call” may not be so final, after all. The bottles are collected, sorted, and cleaned by Earthspun, a textile company in North Carolina that shreds and melts them into liquid. After it's extruded into long filaments, the material is blended with standard cotton fibers and spun into yarn. 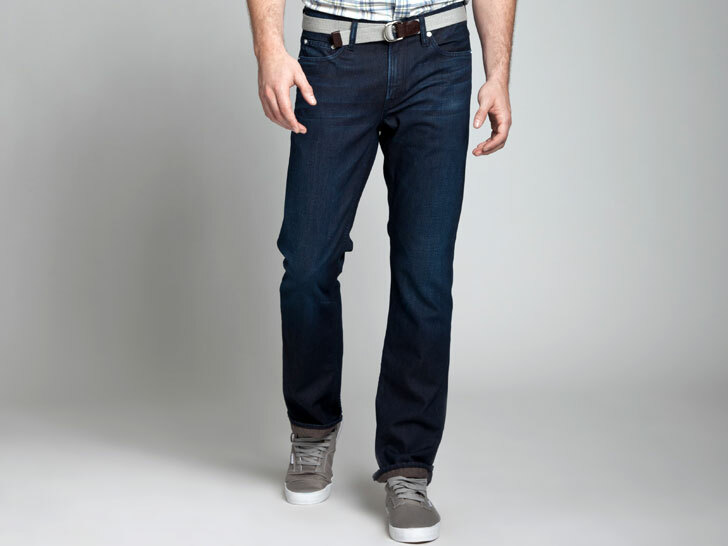 The yarn is then taken to the neighboring Cone Denim, one of the oldest textile mills in the world, where it's woven into a tight, durable fabric. From North Carolina, the fabric heads to Los Angeles to be cut, sewn, and hand-finished into the final garments. Each jean receives a stamp on its pocket-liner to illustrate the number of beer bottles it diverted from a landfill: three for the natural canvas, five for the indigo. "The fabric has a beautiful character to it and we worked with our denim facility in L.A. to develop a really clean, great fitting, five-pocket jean," Brad Andrews, vice president of merchandising at Bonobos, tells Ecouterre. "It turns out that those plastic beer bottles you get at concerts and games actually help make some pretty good looking fabric when broken down and spun with cotton." Can we look forward to pants made from other quirky recyclables? "We are constantly looking for unique and great fabrics for our clothing," offers Andrews. "And based on the great response to this item so far, we will definitely look for more options like this in future seasons."